What don’t you already know about Fall Out Boy? They formed in 2001 just outside of Chicago and From Under The Cork Tree was released in 2005. It was their third full-length and first for a major label (Island Records). This album features their breakout single, “Sugar We’re Going Down”, three minutes and 49 seconds of pure emo-pop bliss. Their bass player, Pete Wentz, became the dude everyone loved to hate (Remember when he jumped off a speaker and nobody caught him and he came crashing down to the ground?! Yeah. ), and overshadowed all of the other band members (Wait, there were other guys in the band besides Mr. Wentz?). I’m sure you know all about Fall Out Boy (FOB) already. But that first big single stuck with me, and occasionally I would call it up on youtube to watch the video and hear the song. I never paid much attention to their other singles, but “Sugar We’re Going Down”, man, what a great song. I was cruising last.fm a few days ago, and found Fall Out Boy’s new album (Folie à Deux) on their most-played of 2009 list. 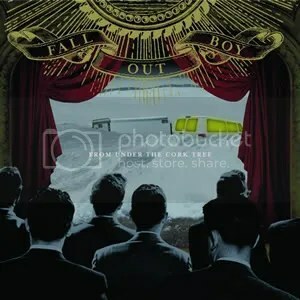 I acquired From Under The Cork Tree and I put on that much-loved song. I can’t help but play air guitar to those few chunky chords that come after the chorus. I am done being “cool” and I don’t care if you think it means I have crappy musical taste (Because musical taste is all subjective anyway so what does it matter? I’m sure you like some crappy things too, right? ), I like that song. Say what you will about the band; damn, it’s a catchy single. It’s no wonder every teenage girl in America was head over heels for this band. There you have it. This post has a lot of parentheses, but I think the gratuitous parenthetical usage would make Fall Out Boy proud (or irritated that I am sort of making fun of their song titles in a passive-aggressive manner). This entry was posted on January 17, 2010 at 12:00 pm and filed under TheSlacker. You can follow any responses to this entry through the RSS feed.